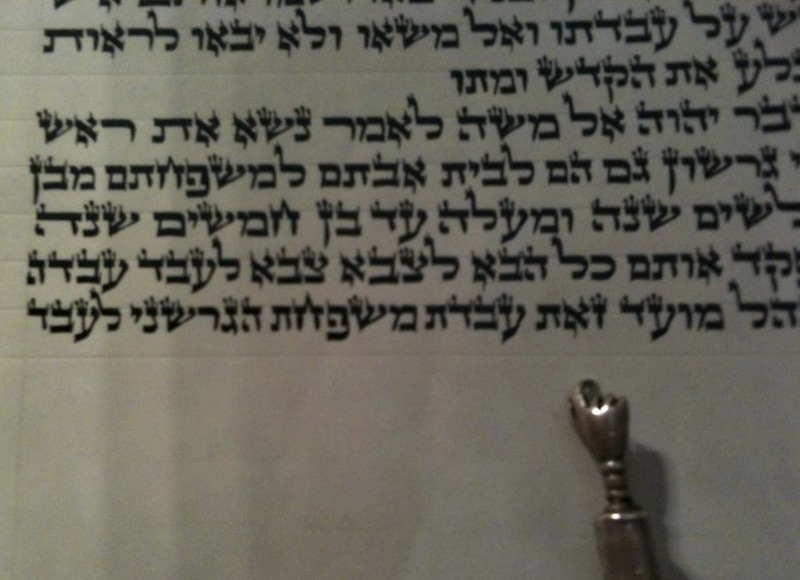 I gave this d’var Torah at Nehar Shalom Community Synagogue on November 13, 2015. 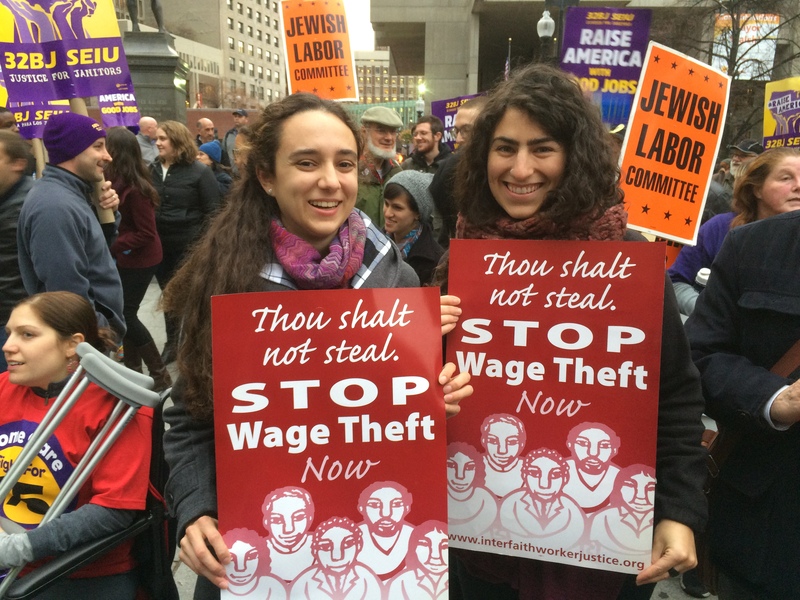 On Tuesday afternoon, I skipped my halakha class in order to attend a “Fight for 15” rally downtown. This local effort was part of a nationwide day of action, a “March for Racial and Economic Justice,” aimed at increasing the minimum wage in our state to $15/hour. Outside of Faneuil Hall, we listened to a dozen plus speakers, and then we marched with our signs about a quarter of a mile to the state house, where we heard from state Sen. Dan Wolf about a bill that would mandate a $15/hour wage for fast food and big box store employees. The bill has moved out of committee and now heads to the full Senate. If implemented, the policy would effect more than 200,000 workers in the state, many of whom now make less than $10/hour. I learned about the event through an organizing class that I’m taking this semester: The local group JOIN for Justice is pioneering an online course called “Don’t Kvetch! Organize!” The class has participants from all over the country. At the rally I met up with several of my Boston-area classmates, as well as a few JOIN staff members. The action was meant to be a way to put into practice, or at least witness, some of what we’ve learned so far. The speakers at the rally represented a wide variety of workers: All people of color — and more than a few undocumented immigrants — they included students, home health care workers, fast food employees, adjunct college professors, and child care providers. One woman spoke about her eldest daughter, the first in the family to get into college — and then told of her sadness at the family’s not being able to afford that college. A fast food employee testified that he was striking that day — for the 11th time in three years — for $15/hour and the right to unionize at the McDonald’s where he works. The adjunct compared her insufficient full-time salary, and the paltry wages of the university’s staff, to that of her college president, who makes $3 million/year. They had in common long hours, exhausting work, job insecurity, lack of benefits, and painful choices around spending because of their paltry compensation. I am proud to report the robust Jewish presence at the rally. Besides the JOIN students and staff, also represented were the New England Jewish Labor Committee, the Jewish Alliance for Law and Social Action, Moishe Kavod House, and the Boston Workmen’s Circle, plus just some individual, good old fashioned Jewish activists — some of whom are part our community here in JP and at Nehar Shalom. And this is just here in Boston: All over our country, from L.A. to Chicago to Miami, on Tuesday Jews marched for racial and economic justice. This demonstration of our commitment to justice as Jews got me started thinking about the Jewish values that underpin that commitment. I’ve learned — and will teach as a rabbi — lots of texts that speak directly to those values and that commitment. But this week, as I learned part of our parshah to chant tomorrow morning, I wondered about workers’ issues in relation to Toledot. This week’s parshah, as so many in Genesis, is filled with the continuing family drama of the Abrahamic line. Rivka gives birth to twins Esav and Ya’akov, who spend their lives at odds with each other, starting in utero. The tension between them, the text explains, stems from their differences. Before I explore this further, I want to note that this interpretation of Ya’akov and Esav is uniquely Jewish. Growing up a Protestant, I learned the story of the warring twin sons of Yitzhak quite differently: I was taught to strive to be like Esav, not Ya’akov, who in my tradition was regarded with great suspicion because of his dishonesty. The difference in Jewish and Christian traditions in their interpretations of this story continues to be one of my most surprising experiences as a convert. As a Christian I learned to valorize Esav’s unvarnished physicality, and I saw a bit of this value in the clergy invocation offered at the beginning of the rally on Tuesday. The Christian pastor prayed for workers’ continued mobility and physical stamina, that with Gd’s help they might have the strength to get up each day and run, and that we at the march might continue the walk to justice. I have to say — as a future rabbi who hopes someday to be asked to give an invocation at the beginning of a rally — I was disappointed at the ableist language that he used. And yet asking Gd for vigor wasn’t totally out of place. It’s physically draining to be a fast food worker, or a child care provider, or a home health aide in way that it’s just not to be, say, a rabbinical student. The pastor recognized that and prayed for the need he saw in the workers at the rally. To bring the metaphor back to our parshah, he identified them with Esav. As I mentioned earlier, tomorrow morning I’ll be chanting Torah here, and since we’re in the third year of the triennial cycle of Torah reading, we’ll be looking at the end of parshat Toledot. As I practiced the leyning, I found myself quite moved by Esav’s distress at the discovery Ya’akov’s deception of their father Yitzchak. Incredulous, he wails, “Have you but one blessing, my father? Bless me too, my father!” And then וַיִּשָּׂ֥א עֵשָׂ֛ו קֹל֖וֹ וַיֵּֽבְךְּ: “Esav raised his voice and wept.” We’re also told that he cried a great and bitter cry, וַיִּצְעַ֣ק צְעָקָ֔ה גְּדֹלָ֥ה וּמָרָ֖ה. Much of this vocabulary will later appear at the beginning of the book of Exodus, when the pain of the Israelites reaches Gd’s ears. It’s hard not to see some anticipation of the slavery in Egypt in Esav’s reaction. So even though traditional commentators have been quite harsh with Esav, I see points of strong poignancy in the text with regard to him. What I hope for us is that seeing the story of Esav through the lens of the struggles today of hourly workers might engender some understanding — and maybe even some righteous indignation — about the situation of both. The vitriol that I see directed at Esav by traditional sources is quite troublesome to me: He is almost universally condemned as wicked, a adulterer, and a despiser of Gd — predicted to be — and later accused of being — a murderer. I see in the rabbis’ attitudes toward Esav a parallel to some of the unflattering narratives that our society creates around the working poor. But I think the Torah actually creates sympathy for Esav’s plight by comparing his pain to that of the later, enslaved Israelites. And like many workers today, Esav is completely depleted by his work. Like many workers today, Esav suffers because of others’ perception of scarce resources. Like many workers today, Esav is forced into painful tradeoffs for basic necessities. We can and should feel compassion for people in these situations. The jobs that the workers at the rally describe are generally not ones that we do want or would want for ourselves and our loved ones. I marched on Tuesday because I believe that low pay is not worthy of the dignity of human beings. I see the racism that underpins the fact that low-paying hourly jobs in service industries are often filled by people of color. It’s not good for our communities when families struggle to make ends meet. And even though as a rabbi I don’t expect to make a comparable hourly wage, I think that our obligation as Jews is to act boldly for the common good — and that our real birthright — available to us all, not just the firstborn or his trickster younger brother — is our commitment to this kind of everyday revolution. 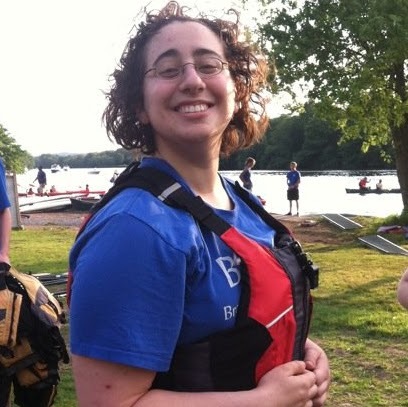 My first guest post: a d’var Torah by the awesome Emily Fishman! The oft-quoted Leviticus 19:18, “וְאָהַבְתָּ לְרֵעֲךָ כָּמוֹךָ– love thy neighbor as thyself,” literarily comes to summarize a list of how to set up your world to be a just one, where the vulnerable are protected and the powerful have their privilege checked. One of the specifics in the section is לֹא-תְקַלֵּל חֵרֵשׁ–וְלִפְנֵי עִוֵּר, לֹא תִתֵּן מִכְשֹׁל, “Do not curse the deaf nor put a stumbling-block before the blind,” verse 14. This verse, especially the bit about the stumbling block and the blind, is quote frequently in halakhic literature as a shorthand for entrapment, luring someone into sin. For example, an adult is forbidden to hit their parent, that is a matter of law. The parent, though, should not hit their adult child lest the child be tempted to hit back — that is a matter of lifnei iver. Another example: A nazirite is not allowed to drink wine. Therefore you are not allowed to offer wine to a nazirite because of lifnei iver. By contrast, veahavta lereiacha kamocha is hardly heard in legal discourse, outside of a few citations by the Rambam. And I can imagine how helpful it could be! Don’t hit anyone — because love they neighbor as thyself. Don’t overcharge in business — because love they neighbor as thyself. Don’t throw loud parties at 3am — because love thy neighbor as thyself. But no, it’s the bit about the blind person that gets dragged out time and time again. In interpreting biblical verses, giants in the tradition, such as Rashi and Rambam, pull on the Talmud’s statement, “Ein mikra yotzei midei pshuto” (Shabbat, yevamot) — a verse’s interpretation may not contradict its plain meaning. Though it isn’t universally applied, let’s try it here. What is the literal meaning of lifnei iver? The halakhic implications of not putting stumbling blocks in front of the blind would surely include tucking your backpack under your chair rather than leaving it in the aisle at the library. Making sure that all announcements posted on the bulletin board are also conveyed auditorily. Taping down the edges of rugs so they don’t get folded and become tripping hazards. Using lifnei iver to name a category of situations where a person is drawn to forbidden acts not only obscures the simple meaning of the verse, it also subliminally erodes the esteem in which we hold blind people. They lose their agency, becoming faceless victims to circumstance, led into horrible situations because they can’t control their own environments. We have a similar problem in English. We say that someone is “deaf to the cries of those in need” or “blind to the plight of people.” What we actually mean is “willfully ignorant.” We use “schizophrenic” to describe an incoherent argument and “obsessive-compulsive” to describe our coworker’s tidily organized desk. But this leaves us open to harming others in our inarticulate use of language. How would it feel to be a deaf person and have your identity constantly used to mean “ignorant”? How would it feel to be struggling with anxious repetitive behavior that caused clinically significant impairment and have your diagnosis dismissed as behavior typical of precise or controlling personality types? Perhaps we are drawn to expansive readings of lifnei iver because we convince ourselves that we would never be so careless as to place an actual barrier in front of an actual blind person. And it feels daunting to try to shift our language around any of these issues. There are too many people asking too many things of us. And maybe I don’t understand why they are asking me to change my language from an intellectual or emotional perspective. How would the halakhic category of caring for each other’s vulnerabilities be different if we framed it as Veahavta lereiacha kamocha instead of lifei iver? If we came from an angle of thinking through and asking how we can be of service to another human like ourselves, rather than taking a patronizing tack and assuming we know how to best serve a person who is unlike us? Veahavta lereiacha kamocha relationships are admittedly harder than lifnei iver relationships. It requires us to learn about each other’s experiences, act with compassion and humility, give benefit of the doubt, and trust that everyone else is doing the same. But what we stand to gain is a life where we learn about each other’s experiences and community characterized by compassion, humility, trust, and second chances. Kamocha means that the person in question is fundamentally like me, relatable. It pushes against our instinct to view ourselves as separate from each other. Kamocha encourages us to see difference as incidental rather than fundamental. This solidarity lends itself to compassion. Problematically, the lifnei iver frame puts me in a place of approaching an “other” who is fundamentally different from me. 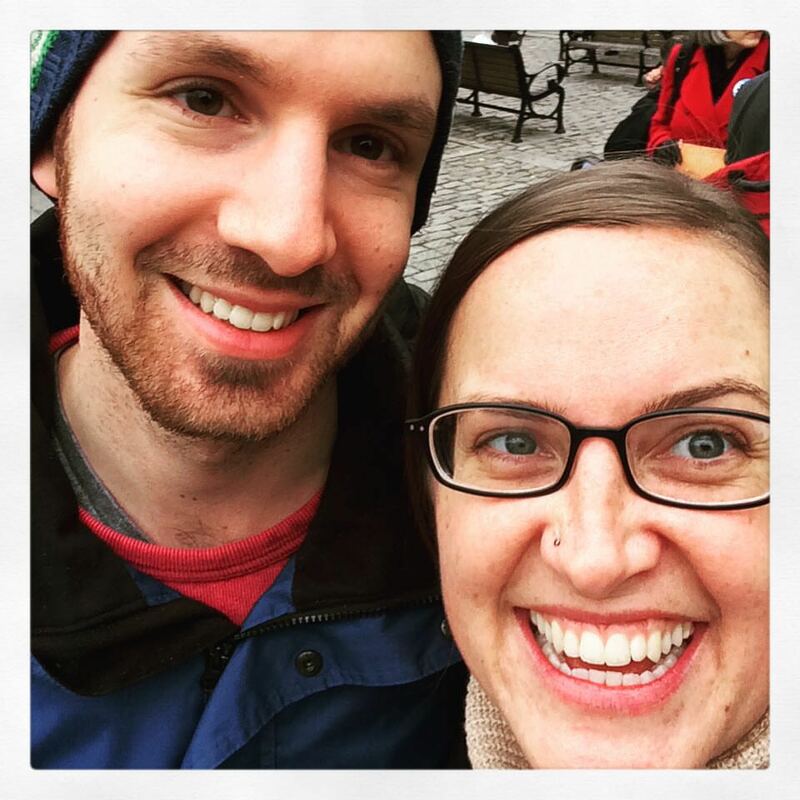 On the other hand, the veahavta lereiacha kamocha tack lends itself to broadly defining who we mean when we say “us” and using language to both reflect and encourage inclusive notions of community. But if we work the same situation from a frame of veahavta lereiacha kamocha, we come to a very different conclusion. A human being has told me that they want me to change my language around a particular topic — gender, mental illness, disability, race, income, whatever. They seem to have a real stake in the issue. Veahavta lereiacha kamocha does not invite me to weigh whether I think this language should or shouldn’t matter to them or whether it will or won’t radically change society. It invites me simply to respect another human’s stated experience and join them in creating the world they wish to live in.